Carpet replacement can cost a lot of money! Richmond Residential Carpet Clean can beautifully and expertly revitalize your home carpet or commercial carpet for a fraction of the cost of replacement. Regular carpet cleaning will maintain the integrity of carpet fibers, extending the life and vibrance of your home or commercial carpet for years to come. 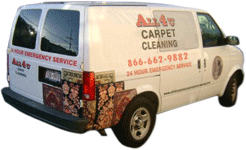 S F Bay Area All 4 U Carpet Clean will thoroughly and organically shampoo your carpet to kill bacteria on contact. We will also sanitize and scotch guard your carpet to ensure maximum protection. With scotch guard treatment any spills can simply be wiped away! At S F Bay Area All 4 U Carpet Clean, we know that there are sometimes certain areas of your carpet that demand special attention, so please just let us know. With our careful and organic cleaning service of your carpet you can save money and ensure the long-lasting comfort of your home.